What to make of COP 19? The flight from London to Warsaw this week gave me a chance to flick through the latest World Energy Outlook from the IEA (I couldn’t use the word “read” here as that would barely be possible on a flight to Melbourne, let alone Warsaw) and read a number of articles in the principle introductory publication to COP 19 (Climate Change – The New Economy), which amazingly enough was available in the BA Lounge at Heathrow. Further to these publications, UNEP released their 2013 Gap Report on Wednesday afternoon at a side event in the football stadium where the COP is being held (it doubles as a convention centre). 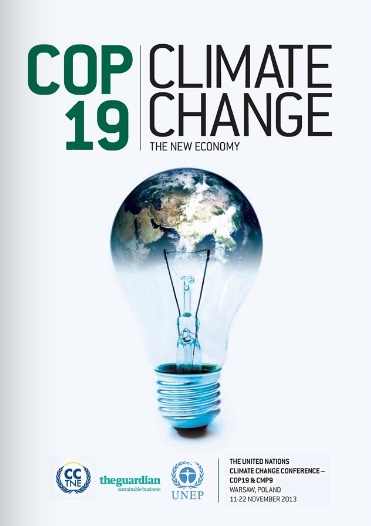 The COP publication contains a series of articles from various stakeholders, all extolling the virtues of one particular technology over another as a means of delivering the needed emission reductions over the coming decades (e.g. efficient lighting!!). But on opening the publication there is a two page advertisement for a much more efficient and clean coal bed methane to liquids process under the heading “You will be amazed what we can do with coal”, followed by a two page spread from WWF titled “Help Save the Fridge”, with an expansive picture of pack ice in Spitsbergen. This rather sets the scene for the tensions that may well run right through this particular conference. The document then continues with messages from the Polish Minister for the Environment (the COP President) and Christiana Figueres, Executive Secretary of the UNFCCC. Ms. Figueres’ article outlines with great exuberance how climate change represents “the mother of all opportunities” and goes on to note that more than 30 countries have climate legislation and 100 countries have renewable energy regulations. Of course she needs to be optimistic, how else could anyone face up to the reality of increasing global coal use and the task of delivering a deal that needs to bring global emissions to somewhere near zero later this century. The contrast between these realities is highlighted by the UNEP Gap Report and the IEA World Energy Outlook. The Gap Report clearly recognizes that current national actions will not put us on a trajectory that looks anything like 2°C, but it then outlines a wide range of actions that UNEP claim could potentially be taken to reverse this trend. Although the Gap Report notes that timing is now very tight, it nevertheless goes on to outline reduction potentials across all the major emitting sectors (including agriculture) that add up to 17 GtCO2e per annum (middle of the range) below “business as usual” in just six years. This would take us well below current emissions and reverse a trend, almost overnight, that has been a reality for over 200 years. The IEA also present a 450 ppm scenario, as they always have, but perhaps a more realistic scenario is their New Policies case. This scenario assumes the continuation of existing policies and measures (like the ETS in Australia !!!) as well as cautious implementation of policies that have been announced by governments but are yet to come into effect (e.g. the ETS in Korea). Given the pace of energy policy change over the last decade and the time it takes to debate, agree and implement new policies, this is probably a much fairer assessment of what is to come. 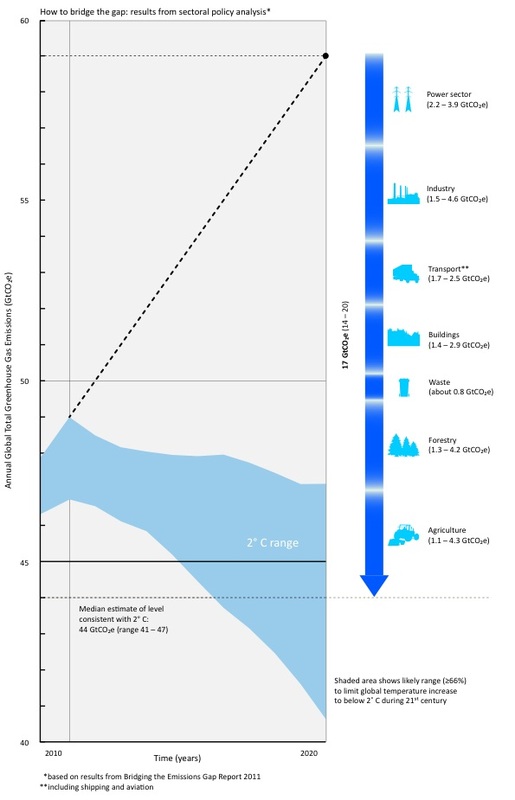 Under this scenario, CO2 emissions in the energy sector rise from 31 GT in 2011, to 34.5 GT in 2020. This is quite a modest increase of just 1.2% p.a. which may well have been (almost) realized between 2011 and 2012 (see previous post), but that depends entirely on whose data is used. However, it isn’t the reduction that UNEP is saying is still possible. This isn’t exactly news, but despite the wealth of optimistic publications and climate-speak here in Warsaw, the 2°C pathway remains out of reach. Perhaps the two page spread in the front of the COP publication was inserted as a sobering but much needed reminder of how the energy system is actually developing. Until delegates and observers come to terms with this and plan for it rather than attempt to swim upstream against the deluge, it is hard to see real progress being made. There continues to be a lot of criticism of the fact that Poland is holding this conference while at the same time continuing to run its economy on coal, but hopefully this actually helps ground the process in the difficult reality that is the current global energy system. Is there cause for optimism on emissions? World leaders have failed for so many decades to act responsibly to end fossil carbon emissions to limit global warming. Warsaw could result in meaningful action if leaders there chose accept reality. If this set of leaders decides to choose suicide, then another set of leaders could choose to stand up and make change happen. The world will run on coal until we either run out or cook or until we choose to leave remaining coal in the ground. So long as we fail to choose to act, I guess we may as well continue to flap our lips at one another until we can convince each other to choose to act. What else is there to do? Hunger strike? Well one person here is on a hunger strike and the rest are just talking about money. As for leaders, most have stayed away.